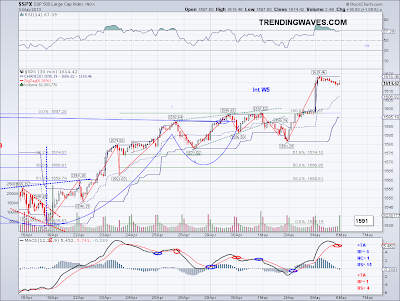 The Cup and Handle target was met today and the market is now at the upper end of the revised target range ( I should add that 1685 is 1.618 of Int W1 so an extension is very possible). I am looking at couple of levels for support and they are 1636 and the 1623-26 area. 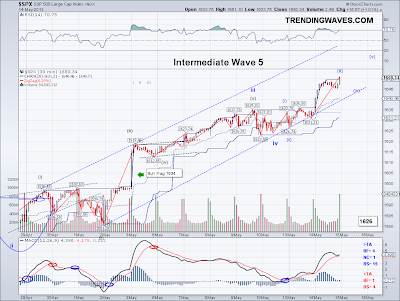 Which level ends up holding will probably give us clues as to how this correction will evolve. The less severe the initial correction, the higher the chances of a zig zag or double zig zag. 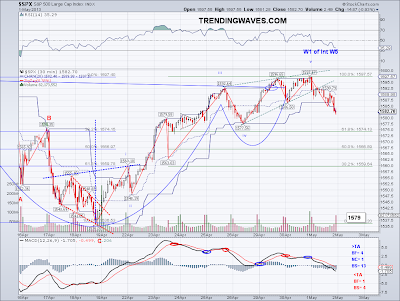 But if we get one big sell off to the 1585-1597 area then I will favor a triangle. 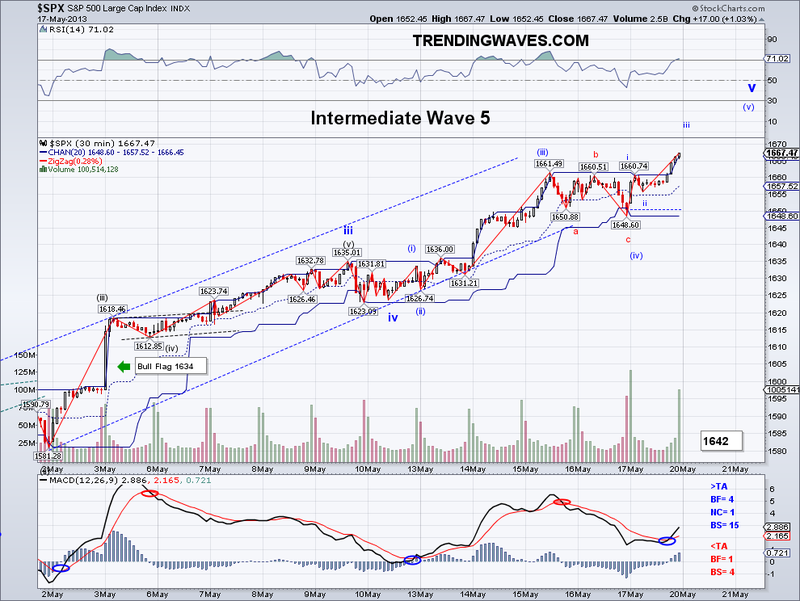 Also, I expect the Int W4 correction to take some time to work off the overbought conditions (and make no mistake the market is very overbought at this point). So if we get to the target in the next week or so then I will be looking for a triangle as possibility for the LT Int W4 correction. 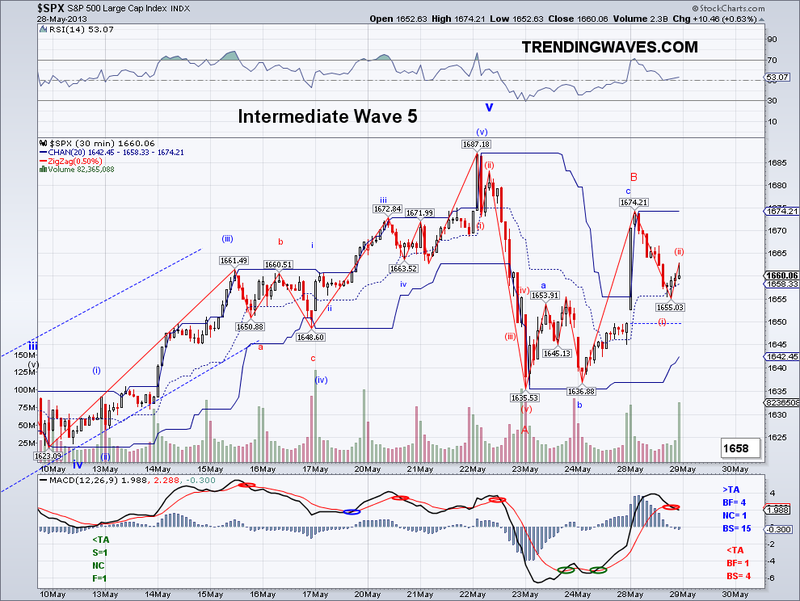 Obviously the market is free to start the LT Int W5 once the target is reached but I think the market needs an oversold base to start a nice rally. When all those bearish "experts" start ringing alarming bells that's probably going to be the bottom of the correction.. so be on the look out for Marc Faber, Roubini and Pretcher.. lol. I had a very nice VXX day today and I think made enough for a vacation and coffee too. However, my plan was to sell half at the close to lock in some profit but because I was in a rush to go meet a friend for lunch, I closed the position 3-4 minutes before the close around 1636-37 and missed out on a good chunk of profit since the market dropped 7 points in the last 3 minutes. But profit is still profit plus I still hold the other half, so not like I am complaining. The somewhat conservative bearish 5 wave count is now out since the market made a higher high but the chart now looks actually more bearish. I wanted to write about this alternate scenario yesterday but I didn't have time. 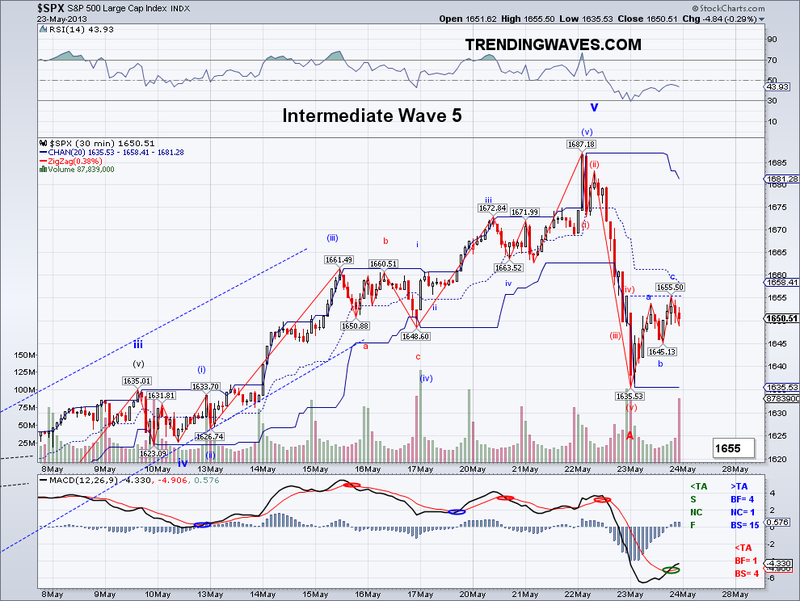 I was going to say that the 5 wave count I had been following was considered conservative given the fact that the alternative called for the bearish W4 I was tracking to be labeled a bearish W2. So now that this is the main count I am following, the new projection is 1590-1600 which would put the C wave around the 1.618 level of A. The alternative bullish possibility is a W4 triangle but since I follow the trend, I give the bearish possibility a higher chance. I ended up position trading VXX in the morning and sold within a few minutes for a decent profit. So I closed that position and started a new one at $18.60, which is couple of cents better than the one I had before. Now I just need the very bearish count to materialize to test out the calling system I set up over the weekend and make some vacation money! I was tempted to position trade VXX when the market hit 1640 but abstained. So I am looking for a good level to lock in profit.. maybe tomorrow I will get the call! The market looked bullish today by gapping up big early morning today and ending the day green. However, the substantial reversal that took place after the gap tells a different story. For the first time in quite a while, rallies are being sold into to which a sign of distribution (from the big guys to the unsuspecting future bag holders). 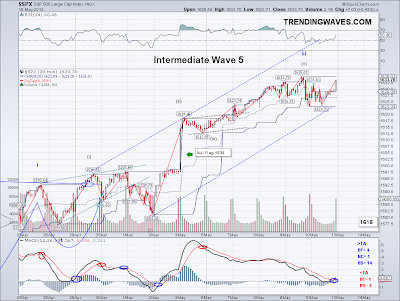 So while the market managed a close above the TA, I am leaning bearish betting there will be more closes under the TA. Also, if the reversal wave we saw today was a bearish W1 then I am expecting 1625-1635 to be challenged again but this time it would be the lower end of the range. If this is not the beginning of a bearish 5 wave count then there will be more choppy trading until possibly challenging the 1687 high for a flat correction. If the market is able to regain the TA firmly I will look for bullish set ups and trade accordingly. Until then I am wearing my bear suit for the SP500. The market closed again under the Trend Average and this is the first time the SP500 has had 3 red days since March, so it has been a long overdue correction. 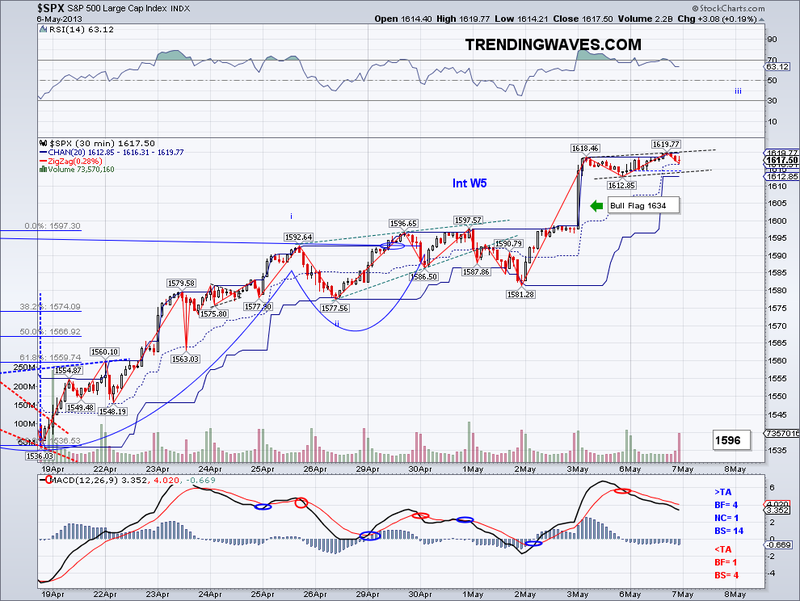 However, the TA is still trending up so the signal is still neutral. 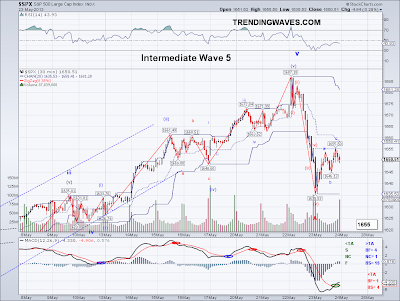 I am adding an "Alt W3" to the A label to the chart until we get a clearer picture as the market could in in a bearish 1-2 (of a W5), triangulating or putting in a WXY correction. Also, I wanted to add that since we will most likely see an Int W4 to expect the TA to get whipsawed. So while we might get a change of trend confirmation next week, the market is free to go back to the 1660-1670 area on just a regular bounce. I ended up selling VXX at 19.06 in the morning for a very nice profit, went long FXI, sold it as well for a profit at the end of the day and initiated a new position in VXX at 18.72 (technically I should have stayed out of the market but I guess I need that pre-market adrenaline rush). So a pretty good day and hopefully I'll squeeze another $0.75-1.00 out of VXX next week... Last but not least, if anyone knows of a service that can convert email alerts to a phone call please let me know. I currently get trigger alerts from TD Ameritrade by email but since I am in the west coast and sleep late, I pretty much miss most of the early morning action which has been very costly in terms of lost opportunities since an email alert doesn't wake me up. However, a phone call to a dedicated phone would do the trick. I searched for this service but couldn't find anything and if I don't see a service available, I will have one programmed and possibly offer it on here for people like me. 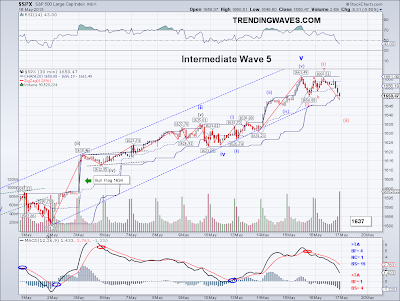 The market put in a bearish 5 wave count with today's low and the short term trend should go negative with another close under the Trend Average. The W4 bounce was the one at close yesterday and W5 materialized overnight to challenge the 1625-1635 area I had posted yesterday. 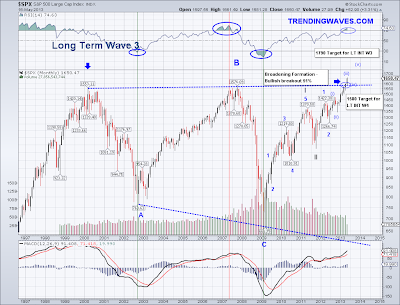 And now that we have a very likely top, we need to figure out how this correction will unfold. I have been posting the 1580 area as a target because I see the Int W5 as part of a LT Int W3 of a LT W3. So going by that count, the market is now starting an LT Int W4 and if that level holds then I am expecting LT Int W5 to target 1790 by the end of this year or early next year. There are obviously other counts floating around but those who are familiar with this site know I count according to trends. That is why I avoid trying to count anything longer than LT waves as I think it doesn't really help someone who is trading. 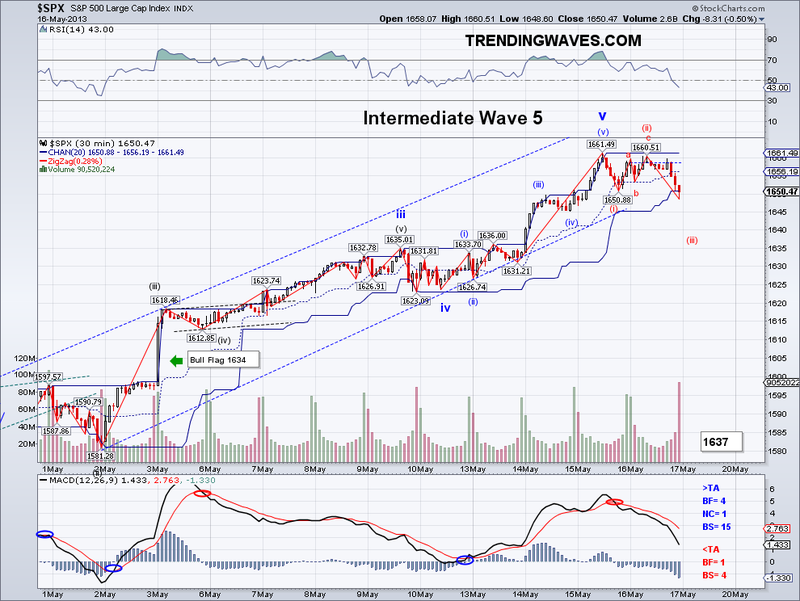 The "bearish" EW crowd will label the most recent 5 wave count as a bearish W1 (as opposed to my A) as they are seeking/wishing for a bear market. Personally, I welcome both markets as my primary purpose is to make money. But based on trends, this bullish rally is just catching break and it well should be after rallying like mad this year. I am sure once further downside materializes on this correction we will see the usual bearish fear mongers on the news again, the Roubinis, Pretchers, Fabers, etc. of the world and that will probably a good time for the correction to end..lol. Just today I saw Doug Kass (who had virtually disappeared from the news) on CNBC arguing why Goldman's Sachs call for 1750 and 2000 eventually was wrong. Problem is Doug Kass has been shorting the market since Jan 1st thinking the market's fair value is 1425.. DK btw doesn't use stops so he has gotten steamrolled by this rally big time. How a professional trader like him trade like this is beyond me. And don't get me wrong, I respect him for putting money on the line as opposed others who just wants to sell newsletters but that is a crazy way to trade. I position traded my VXX and improved it 22 cents so back to $18.31 as my cost avg. 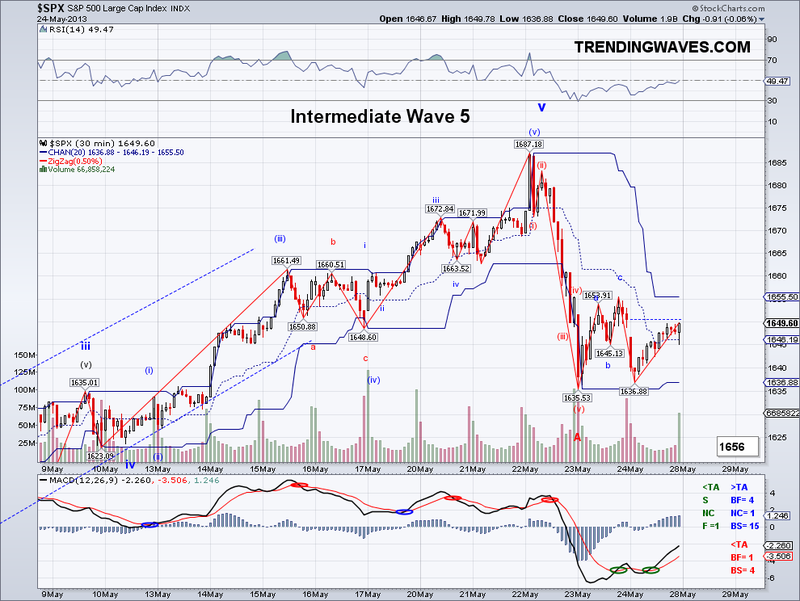 Bearish 5 wave count or ABC? 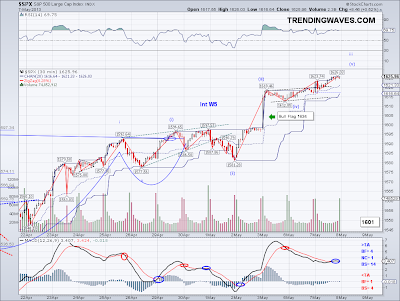 I was wrong in my assumption the market had topped yesterday but still right on the correction and very possibly the top I have been calling for the past week for the wave structure from 1343. In the morning, it seemed like the market was headed for a bullish breakout I mentioned yesterday as a possibility but then the reversal was so swift and strong that all gains were given up and the 1662 support seemed like it wasn't even there. However, the market did manage to hold on the second support level and close right on the Trend Average, a level which by the way the market has not seen in 3 weeks. At this point I am looking for a top confirmation by the Trend Average, so ideally the market will bounce in a bearish W4 and then go down some more to test the 1625-1635 area. That would allow the TA to turn bearish and confirm what I had been expecting since the rally started in January, an LT Int W3 top in May and if that turns out to be the case then I will be watching 1580 as the end of the W4 correction as that is the ideal target. Lastly, I forgot to add a bounce that rallies past 1674 will invalidate the bearish 5 wave count but I doubt the market will rally that much. I ended up selling my VXX position at break even at the break of yesterday's high since I assumed we would see 1700's. But once the reversal came and lower lows were put in, I waited until the end of the day to load back up on VXX at a higher price (unfortunately). It would be a shame if I were to miss a substantial correction which I had been calling for weeks. So my new VXX price is $18.53 as compared to $18.32, not too bad considering the market dropped almost 40 points in a single day. Another day, another all time high.. seems like the norm now days. However, this new high might not be revisited for some time if this is a significant correction. The market made it to the target range I had from last week by topping at 1674.93 and there are now enough waves to complete the 5 wave count I've been tracking. The only thing that I find odd looking is the 4th wave as it looks disproportionate to the 2nd wave but everything else looks fine. 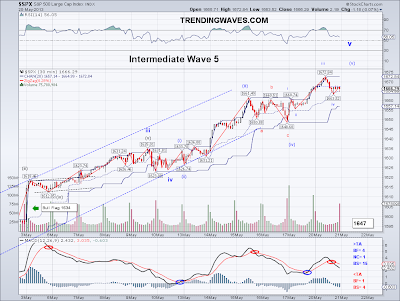 The last time I saw 4th wave looking like that ended up being a W2, so any bullish pattern developing should be respected as it could turn out to a big bullish 5 wave count targeting 1702-1712. 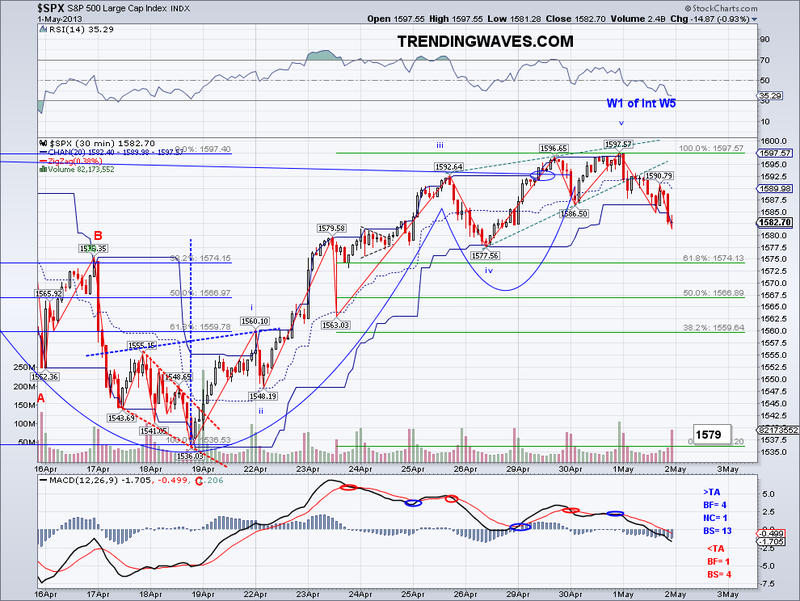 But for now, I am assuming another correction has begun and we will see the 1662 tested first. A bounce from there and then an eventual break of 1662 would leave the 1650 as the next one to watch. My VXX position was looking good at the end of the day and I will be taking profits at the 1662 level and position trade it perhaps on a bounce that challenges 1670 again? If I am able to improve my costs substantially I will trade it less as I believe we are close to a top and would hate to miss a big run. Will the next correction confirm a top? The market made it close to the 1675-80 target area I mentioned on my last update today but it seems like there is one more push left before the next correction begins. But what really matters is whether the next correction is just another minor top or "the" top for the entire wave from 1345. Top calling is hard but I think the market is getting close. I am holding my VXX position as well as my longs. The HSI and the SECC seem to be resuming their uptrends so now it's time for them to play catch up. The market broke out of a broadening triangle formation today (the same exact ABC pattern in the long term chart) and it seems like it is going for the 1675-80 area. 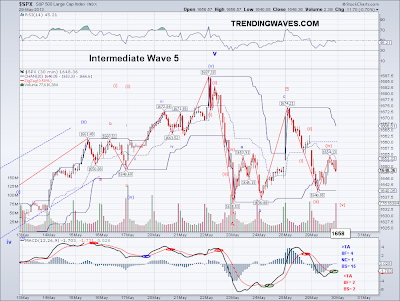 The 1.618 level of W1 happens to fall on 1681 and if the market makes it there then we will have a very ideal LT Int W3 wave. The 5th wave is now extending it is about to overshoot the most optimistic revised estimate I had from April which was 1668. So all I can say is WOW.. it has been a crazy bullish rally on no substantial earnings or economic growth, somewhat similar to Japan. 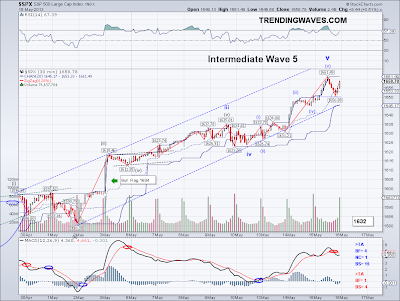 When I speculated late last year on a rally until May based on the LT Int count, I thought it was going to be a rally based on accelerated improving fundamentals. But I guess it is all about the power of QE, which btw I should add that the Feds stock market model has the SP500 at 1700-1750 so they are executing their plan very well. I ended up buying the VXX portion earlier today and in retrospect I should have waited a bit more. But it's ok, can't always have it my way. 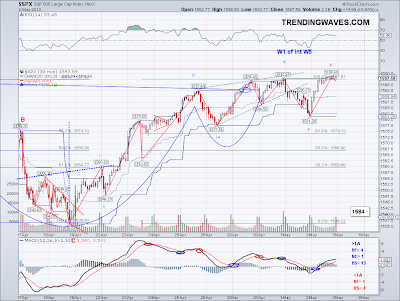 What I need to see now is the real top correction to 1580! lol. The correction that I have been expecting has now materialized but obviously it is still not clear if the market will correct on a W4 and launch again to a new high. Earlier in the day, the market seemed like it was forming a triangle which is a typical W4 formation. 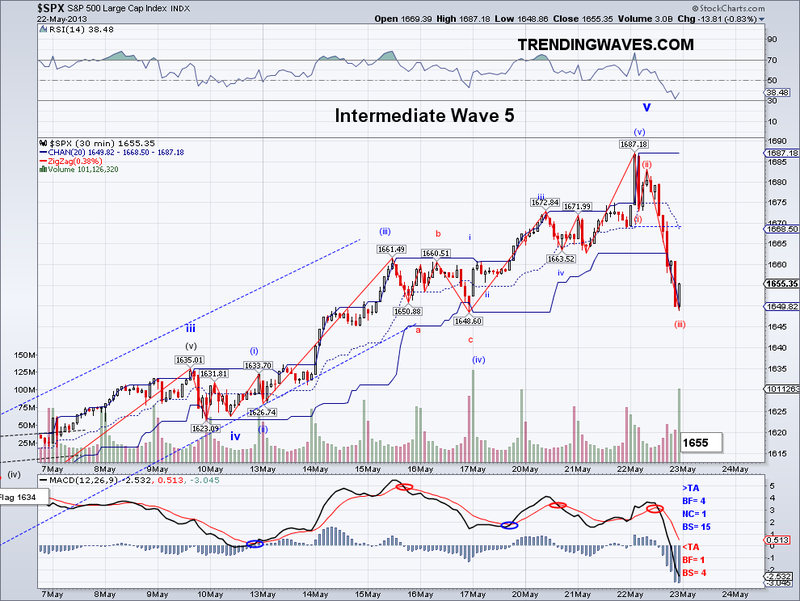 But towards the end of the day the market lost yesterday's low in what appears to be like a bearish W3 or a C wave. If this is a W3, prices will need to go down to the Trend Average and preferably close below it tomorrow. 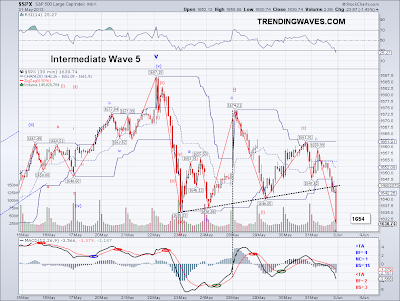 If this is a C wave, then it should be done as a flat or perhaps test the Trend Average successfully and rally again from there. The market has not had 2 consecutive red days in a month, so a red day tomorrow would mean sellers are starting to show up. This is now a market where some people think it will go up forever which in a way is an ideal area for a top. I also posted the long term chart, so you can see the targets I currently have for the current structure. The 1941 number I posted earlier is for the structure from 1076, the targets posted are for the structure that started at 1266.74. Today I did good on my VXX position but I ended up making a mistake. I closed and took profit at 18.62 and then bought them back in the 18.30's. However, because I had been trading a 3k position for the last 2 weeks, I ended up buying back 3k and not the 5k I was supposed to. So I missed out on 2k of VXX and will close that position and start a new one for clarity purposes. My old position has now caught up to market price and already ahead on that one. 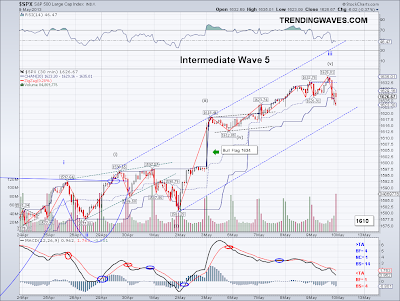 Should the market bounce tomorrow, I will be buying the 2k position or one the rebound if we get the bearish 5 wave count. The market corrected and rallied following the count I posted yesterday and now there is a good chance of a not only a correction but a top. 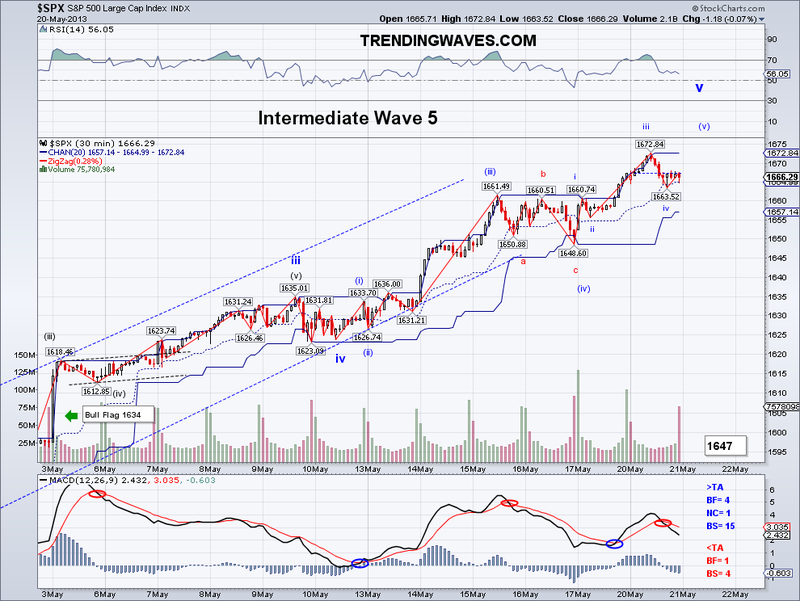 But as I said yesterday, should the market put in another W4 then the last 5th wave just extends but I think this is the topping area more or less. The Cup and Handle target was met today and the market is now at the upper end of the revised target range ( I should add that 1685 is 1.618 of Int W1 so an extension is very possible). I am looking at couple of levels for support and they are 1636 and the 1623-26 area. 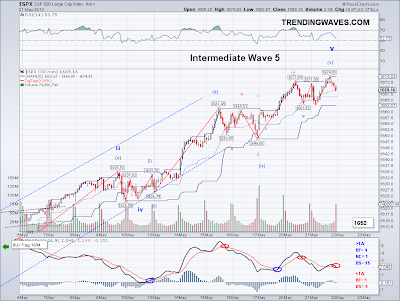 Which level ends up holding will probably give us clues as to how this correction will evolve. The less severe the initial correction, the higher the chances of a zig zag or double zig zag. 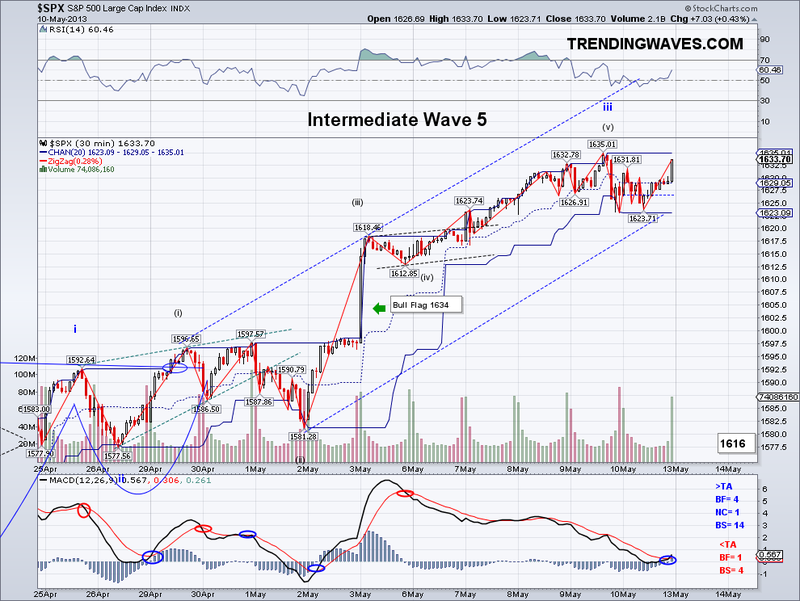 But if we get one big sell off to the 1585-1597 area then I will favor a triangle. 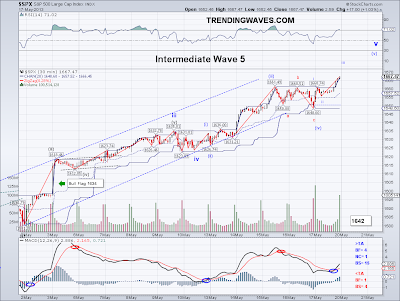 Also, I expect the Int W4 correction to take some time to work off the overbought conditions (and make no mistake the market is very overbought at this point). The Trend Average will give us confirmation but as in most W4s, I expect the TA to get whipsawed by the nature of W4 corrections. 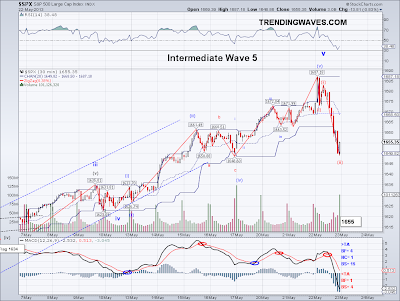 Today I worked on some calculations for the ultimate target for the potential long term 5 wave impulse from the 1074.77 low in late 2011 and I am getting 1942 by the time all waves are in around the end of 2014/early 2015. Also, the ideal bottom for the coming LT Int W4 is 1581 with the top of the entire 5 wave LT Int structure from 1266.74 at 1791 to be completed most likely in early 2014. These calculations are based on my own formulas that I have been tweaking now for a few months. The targets I have mentioned in the past few months are based on this same formula. So as far fetched as these targets might sound, that is what I am getting. Then again, who would have thought the 1642-1668 target I announced in April for the end of the 5th impulse by this month was even possible when the market was having a hard time clearing 1560's in April?? This has been a huge rally that has steamrolled bears, specially those who traded on fundamentals. Today I executed my VXX plan and bought the other half at $18.31. And btw, I will assume I am wrong as I always do when I take positions against the TA until the TA turns red. So should bullish patterns evolve I will be trading in and out of the position for cost improvement just as I have in the past couple of weeks. 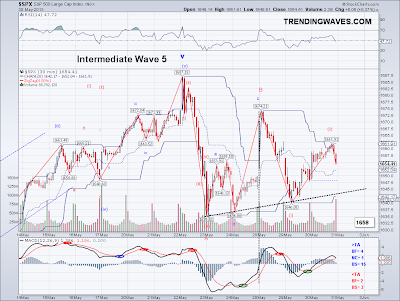 The main indicator on this blog is the Trend Average, waves and all the other stuff comes second so if you are shorting respect the bullish trend! I posted yesterday's update late last night and when I looked at the futures the projection for 1640's seemed optimistic. But to my surprise, the market was trading at 1647 when I woke up so it is now clear to me the market is putting in a 5 wave count before another correction. But if this is a W1, we should see the 1626 level hold for a W2 and then up from there to about the 1650 level, which goes in line with the Cup and Handle projection from couple of weeks ago. 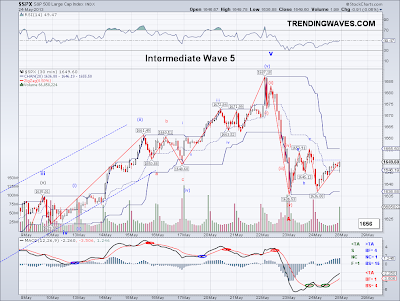 I have been doing these price projections based on my own calculations (If you know of anyone doing price projections based on the initial stages of a wave please let me know as I'd like to see their work) and I try to be conservative with the numbers, meaning I assume 5th waves will not extend. But if they do, then markets will continue higher before a top is in. So while I am sure the market will correct soon, it is hard to tell if the coming correction will be "the top" as we could see W4 after W4 until exhaustion. Based on the most recent multi-week count (the one that started at 1536). 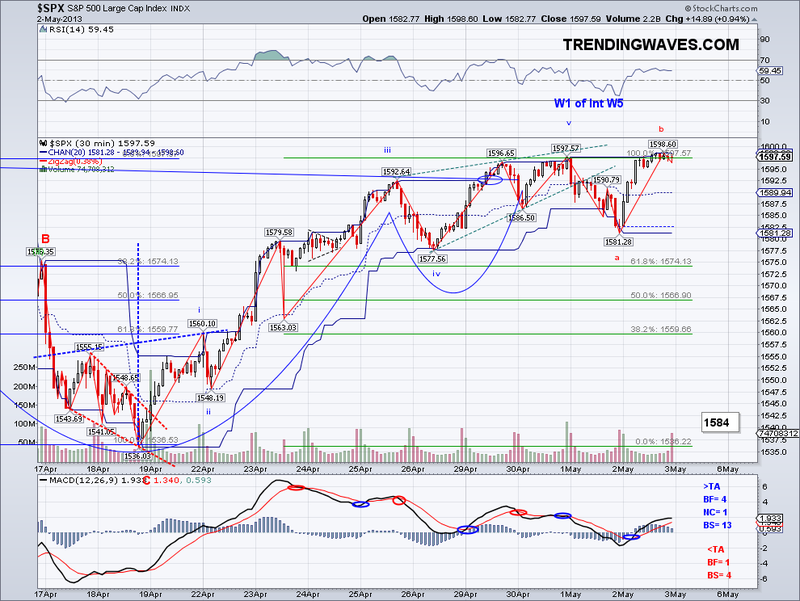 If W1 was from 1536 to 1592, then the market might overshoot the higher end of the target range. 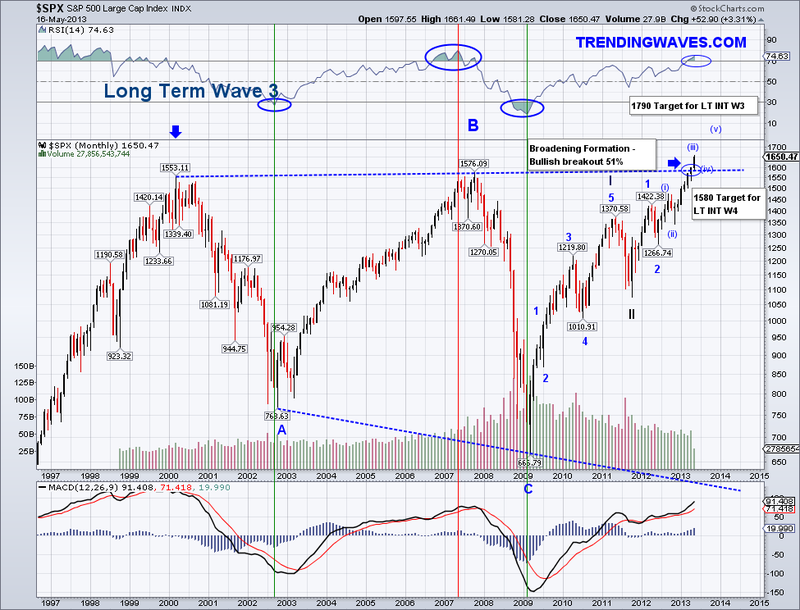 You guys know I seldom call tops, but going by the waves, the market is about to take a significant pause. 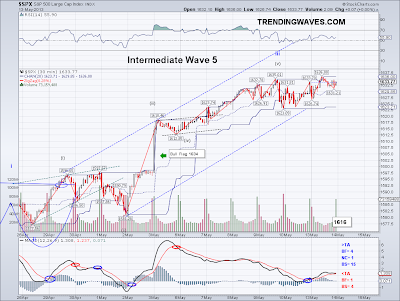 The top will be confirmed by the Trend Average turning red. I ended up buying back my VXX position at $18.24, so I've improved my cost avg substantially from the initial position taken when the market was at 1597. I have to count how many times I've traded this ETN but after being initially squeezed, I've brought down the cost avg from $19.30 to $18.59 and should the market follow the path on the chart, I will buy the other half and have myself a nice summer :) I am assuming the market will do at least a 5% correction which will translate into 80-100 SP500 points. That in turn should net about $5.20 to $6.50 on VXX.. we'll find out soon. The market found support at the 1626 level today and as I mentioned last week, if that level holds then we might see a bullish W3 break out in the next session or two. 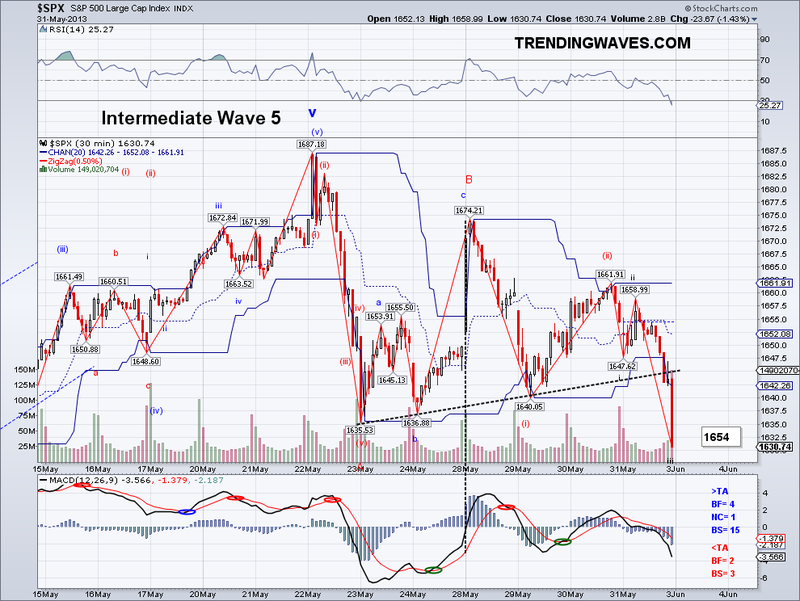 So it seems like the Wave IV is done and the market will be trading over 1640's soon. The markets had 3 days to correct after rallying to overbought conditions for 5 days but the lack of bearish advance just signals strong demand. I ended up selling VXX again after seeing the 1626 level hold. So now I am in cash for that position and waiting to re-enter at a better price, perhaps in the $17's? The market has been bouncing on what seems like a B wave from the 1623 low and it has now retraced most of the initial sell off. 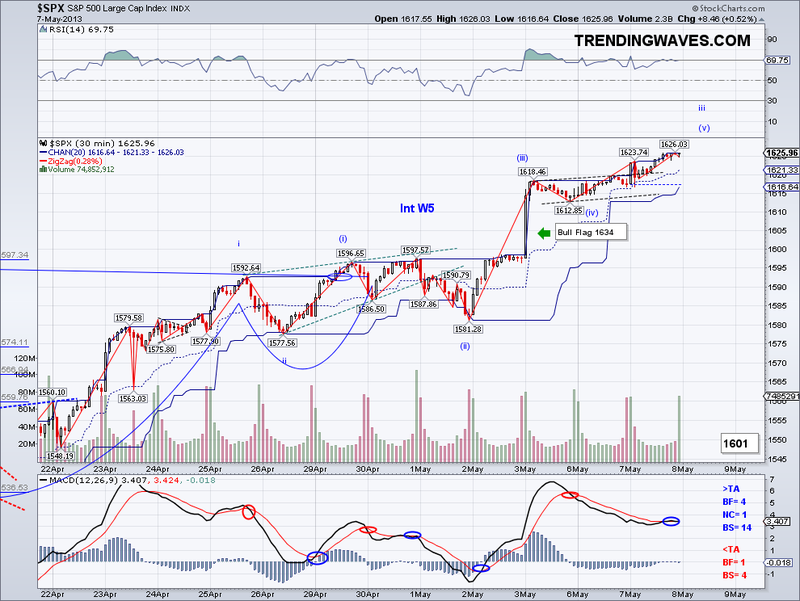 So I think the market is either putting in an ABC Flat correction or a bullish W1. If this is a flat then prices should stop rising at the 1635 level and then head down to 1623 and resume the rally. But if this is a W1, we should see the 1626 level hold for a W2 and then up from there to about the 1650 level, which goes in line with the Cup and Handle projection from couple of weeks ago. I have been able to call corrections fairly accurately over the past year but it's very hard to tell which one ends up being a "top", so I will be watching key levels in case the market continues rallying and adjust my hedge accordingly. I traded in and out my VXX position couple of times for a minor cost improvement and I was originally going to close the position and wait until Monday. But since I've been able to improve my cost average substantially since the 1597 short squeeze, I figure I'll stop loss the position if the market makes it to 1637 or better yet sell at a profit at 1623. Good thing I also have a long position to make me feel better when the market refuses to go down.. The correction I was expecting seems to have started now that we have a reversal day and the first negative day since the break out from 1598. But the market did manage to put in another all time high despite selling pressure early morning and exceed the Bull Flag target from last week. At one point it seemed like the market was reversing the selling and starting a new bullish wave but with 1626 breaking, it now seems likely that there will be more downside. 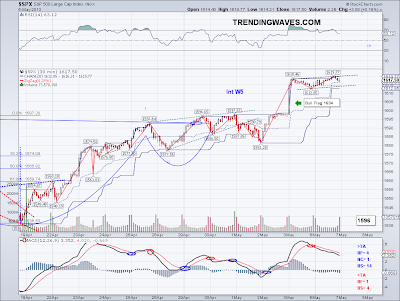 I am looking as I posted yesterday at the 1612-1618 level and the Trend Average. Technically speaking, the high today got close enough to the "ideal" target I have for the market for May, so should the market make a solid break of that 1612 area then it might be the beginning of something bigger but at this point I lean towards higher highs before a "top". 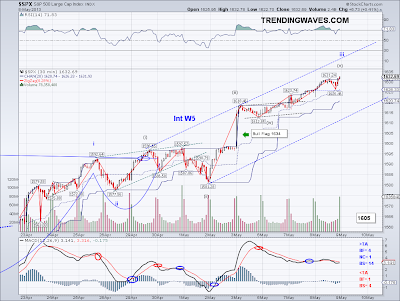 The market has made it to the 1630's as I had been patiently waiting for and now that the bull flag target is technically satisfied and Wave (V) on the WIII is equal in length to Wave (I) on the micro count, I expect a correction to start as soon as tomorrow or early next week at the latest. The ideal support for this bearish wave would be the 1612-1618 area before launching one last bullish wave fueled by people who are coming late to the party. Unfortunately, this is where many amateur investors will get burned as they miss most of the rally and then they try to rush in only to be left holding the bags. It's a mean world but that's how lessons are learned.. I find it interesting fearmongers like Marc Faber, Roubini, etc. get lots of attention during corrections and that prevents average people from buying stocks when they are actually cheap. I was just looking the other day at this page where Marc Faber states he is "100% sure of a recession by 2013" (How can this man be 100% sure is beyond me.. I would cut him some slack if he would have said at least 99% but no, he is a fear mongering genius) and if you look at the poll on the left side, close to 80% of people agreed with him.. that's 80% of people who probably have missed the entire rally and now are kicking themselves in the behind. Anyway, today I bought back all the VXX that I sold earlier in the week at $18.31. Not in the 17's as I had hoped but nonetheless a good price and much cheaper than when I sold. So I'm hoping to squeeze a dollar out of this one. The market continues to make all time highs as expected but this particular bullish run is about to correct so maybe some more upside and the we'll see a test of the Trend Average. I'd prefer to see a gap up and a clear reversal so we can have a good corrective count. At one point this morning I thought a reversal was taking place as the bullish gap was closed but instead previous support held and the market just went back up. So maybe that bull flag target might just complete in the next session or two. I position traded VXX again for another minor gain and should VXX stay this low, I will be locking it in a good price. The low today was $18.06 so almost in the 17's and I think a gap up or something that will scare shorts will send it to the 17s.. I will load up regardless when the market meets its pattern target or if I see a confirmed reversal. The market consolidated today as expected and it seems like it's buying some time before launching to yet another high. There is a bull flag in place that targets 1634 and it was already there on Friday but I forgot to mention it. 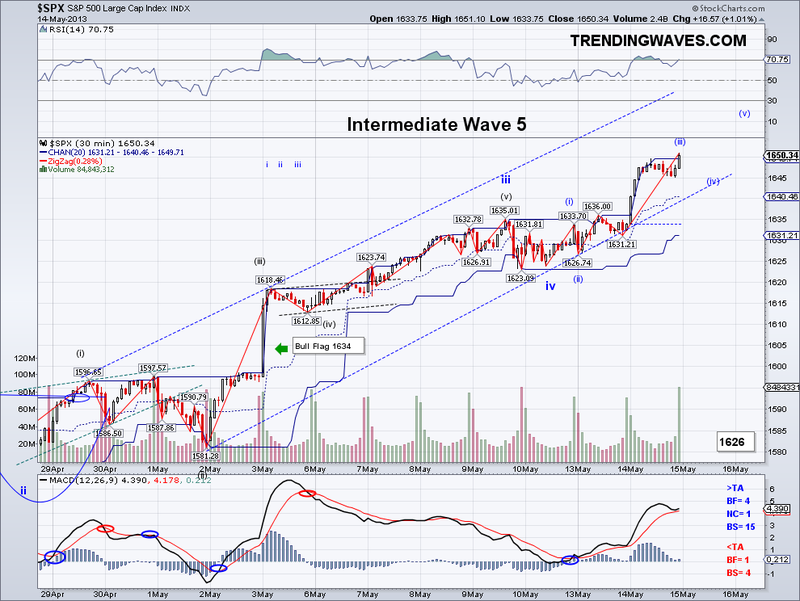 So I am expecting the 3rd wave to finish at that level, consolidate some more and then launch a final bullish wave. Technically speaking the 3rd wave could have ended today as a higher high was put in but until I see a significant retracement, I will assume the target is 1630's for the w3. The Trend Average is now closing in on 1600 and it might even catch up to the market instead of the market going down for a test. And now that the picture is clear, the market is now going to play catch up with the rest of the world, so I am expecting 1475 to be taken out fairly soon and perhaps see the all time high being challenged by May 2013. The Bullish Engulfing Pattern is confirmed and all the 3 trends I track have turned bullish with today's move, so as long as the trends stay there we should see a bullish January. 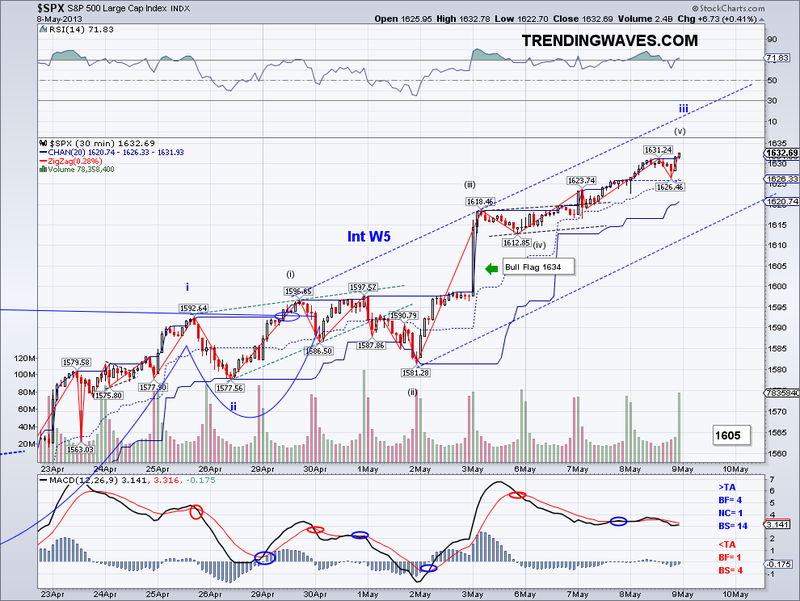 Once we reach the LT-W3, I expect a mild W4 in the summer. So perhaps a correction to the 1536-39 area or the 200 DMA (which would be ideal if the 200 DMA was around 1536-39) and then the start of LT-W5 late summer/early fall. On my VXX hedge, I miscalculated and got squeezed for breaking my own stop rule yesterday. But I managed to improve my cost average a little and I am out of the position until the W3 is finally over so I can hopefully recover all the loses there and perhaps makes a little profit too. The HSI seems to be finishing its Int W1 and it seems like the SSEC will soon follow, so hopefully they will keep rallying as I need my FXI to hit $50! lol. 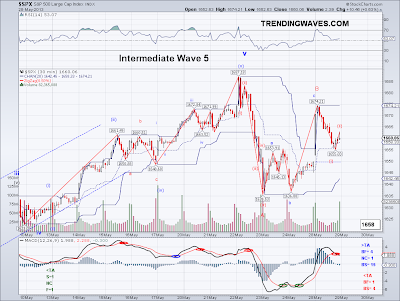 I was expecting a counter rally today in form of a B wave but this wave looks a little more bullish than usual and it closed right in the area where the short squeeze I talked about few days ago could happen. So while I still hope this is just a B wave of an expanded flat, the market could be putting in a W1. 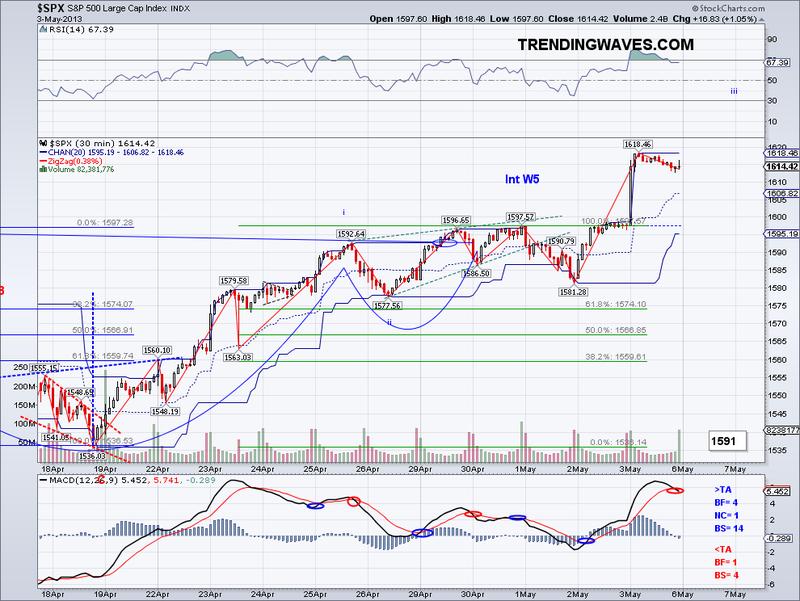 So I am watching the 1586 level carefully, which should coincide with the Trend Average tomorrow. If this level provides support, I expect 1614 on the bullish response. Ideally, I'd like to see a 1.618 C wave so we can have a proper Fib retracement and then see a rally from there since I'd like to see the market correct so we can have a clearer 5 wave structure for the Int W5. I ended up buying VXX but did not stop out at yesterday's high as I had originally planned. I figure we should get at least a correction to 1586 before going through the 1597-1600 area, so I hope I am not miscalculating. And should the market sell off per the several bearish scenarios floating around then it's all good too. But I have to admit being hedged here (never mind being short) makes me somewhat uncomfortable as I don't want to get caught in a short squeeze stampede. 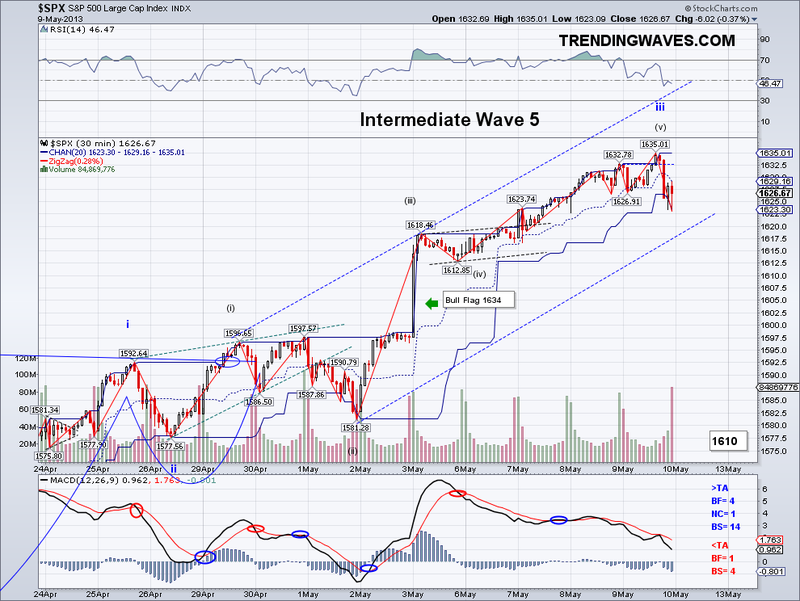 The market hit a brick wall at 1597 and the Ending Diagonal (Rising Wedge) was confirmed with the bearish reversal. But now that it looks like structure seems to be complete, I can add labels to the waves and figure out where I think the market is. 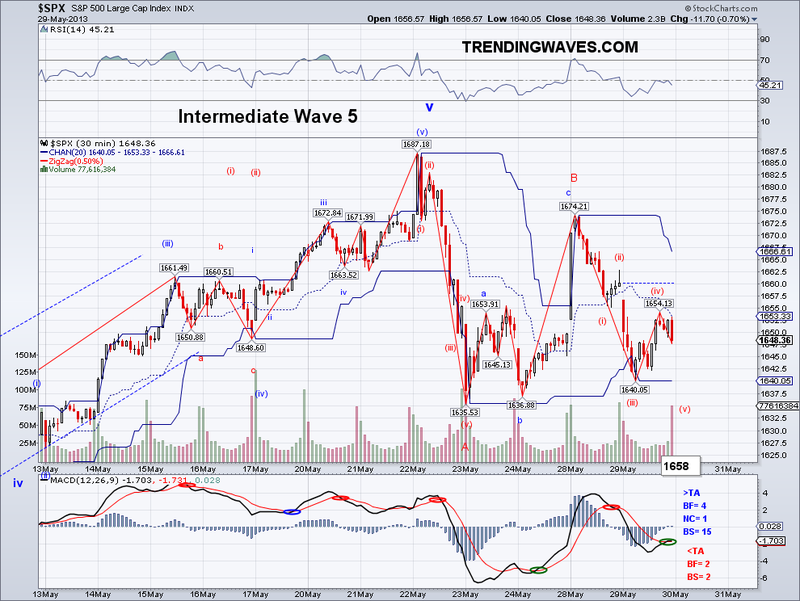 I have the wave from 1536 to 1597 as W1 of W5, so I am expecting a Fib retracement and a continued rally in the next week or so. Should the market break key resistance levels such as 1552, I will start looking into other options. 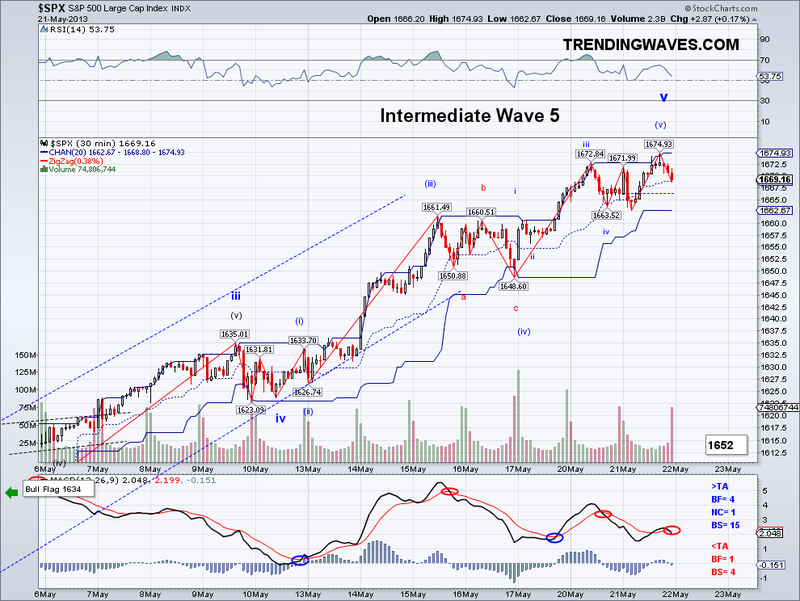 I am aware that some are calling 1597 "the top", while others are calling for an Int W4 correction. But I have to assume the most bullish count until the Trend Average gives the signal. As it is, the market failed to even test the TA on the last correction. 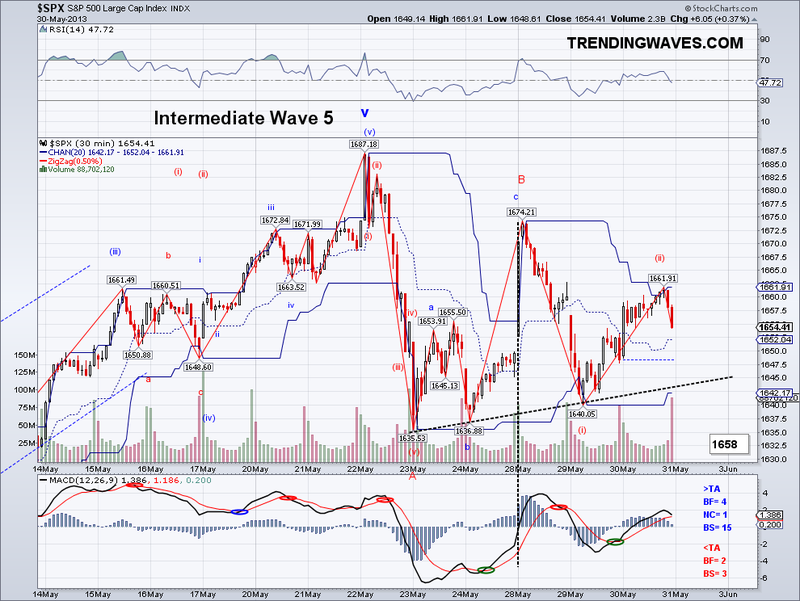 So we'll see how the TA holds on this/next bearish wave. I continue to be on the sidelines on my margin account. But now that 1597 is marked, I will be buying VXX on the bounce and using that as the stop. 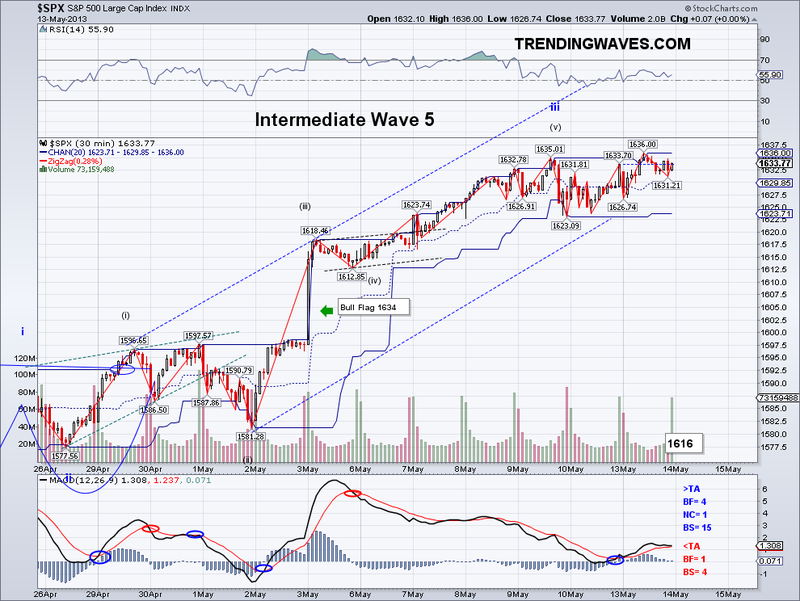 So hopefully it will bounce tomorrow, unless there is bearish nested 1-2, in which case I'll have to wait some more.